Gail Cook Herrmann (1938-2005) was truly a remarkable person. When you read the article below, you will know why. The article comes from an undated newspaper clipping from Rochester, probably either the Democrat & Chronicle or the Times Union. From the dates given in the article, it appears to have been written in 1957. The article was sent to us by our cousin, Elaine Roderick. A transcribed version of the article below is found here. A girl and her dog are a bright spot in the summer session at John Marshall High School this year. The girl, Gail Cook, is blind. She lost her sight at the age of 12 as the result of an operation for a brain tumor. A year later she had polio and “it’s been a fight ever since,” she acknowledge. The cheerful, confident girl who answered a reporter’s questions yesterday gave no hint of the discouragements over past trials or the long struggle ahead of her. She is the first blind student to attend a summer school in Rochester. Both Gail and the teacher of her third-year English class, Philip San Fillipo, were somewhat fearful at first. Although Gail had attended East High Evening School last year, she was uncertain how teen-agers would react. San Fillip had neither experience nor preparation in teaching the blind.Now that summer school is almost over, the fears of both have long since disappeared. “ I was overwhelmed” Gail said. “Everyone has been so wonderful. They made me feel right at home.” The summer school experience made Gail, who is 20 feel she might be able to go to a regular day school. School practice, however, is to encourage students of that age to attend evening school. Each case is handled individually. Gail’s goal is a special secretarial school in New York City for which she needs a high school diploma. She estimates that will take her 2 1/2 years. Crediting Gail’s patience with smoothing the initial humps, San Fillipo is happy with the outcome. Her seriousness of purpose and the manner in which she surmounts handicaps have been a steadying influence on the class, the teacher said. Gail types notes on a Braille typewriter donated by the Rochester Lions Club and produces written reports and compositions on a standard typewriter. She reads Braille volumes and enjoys “talking book” records obtained from the state library in Albany. 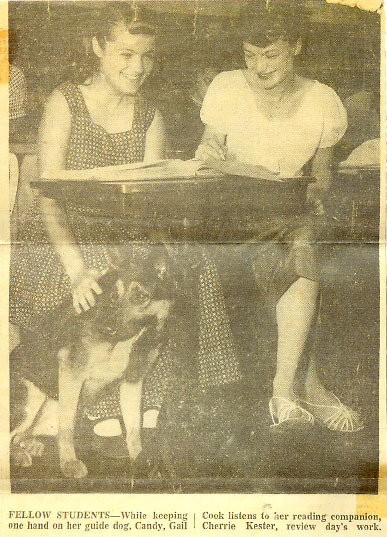 A classmate, Cherrie Kester, is paired for reading services through the contribution of the Well Wishers Club of the New York Telephone Co, Another reader, Adreinne Chafel, volunteered through the Assn for the Blind. Her guide dog, a six-month old German Shepherd named Candy, aids her in making the daily trip by bus fro the home of her parents, Mr. and Mrs. Stillman T Cook, 33 Nellis Pk., to the Marshall classroom. At home, ever brother Tommy, who is only 4 and can’t read, “helps in lots of ways.” Andrew, 11, however, is able to assist with his sister’s homework. She also has twin brothers, Gary and Larry, 18. It was her mother, Gail reported sympathetically, who got sore muscles from the exercises designed to strengthen her polio-weakened left side. No effects of the disease are now apparent. 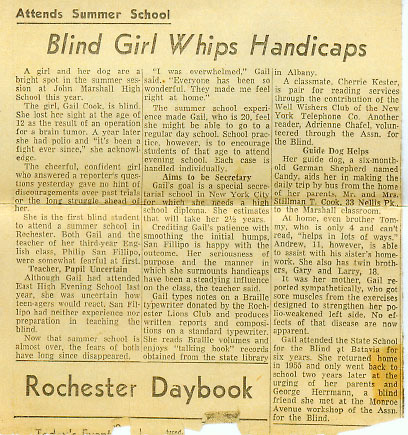 Gail attended the State School for the Blind at Batavia for six years. She returned home in 1955 and only went back to school two years later at the urging of her parents and George Herrmann, a blind friend she met at the Monroe Avenue workshop of the Assn. for the Blind.